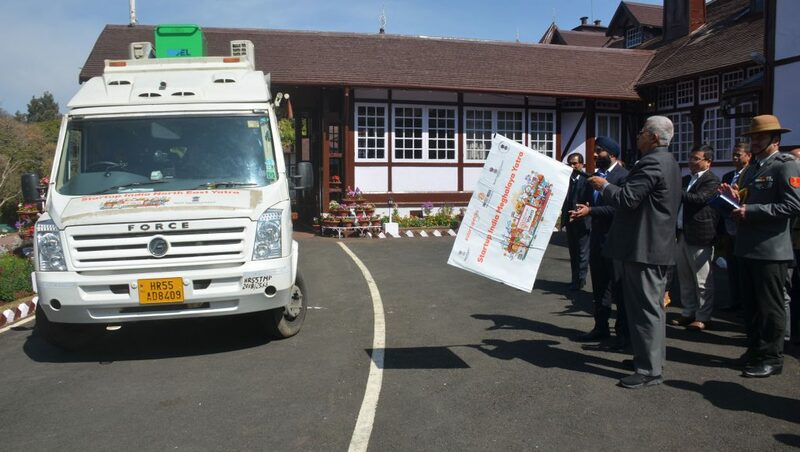 Meghalaya Governor Tathagata Roy on Wednesday flagged off a mobile van of Startup India Meghalaya Yatra from the Raj Bhavan at Shillong in the presence of officials from the Department of Commerce and Industries. The Startup India Meghalaya Yatra, from February 13 to February 23, 2019, is being organized by the Ministry of DoNER in collaboration with the Department for Promotion of Industry and Internal Trade (DPIIT) and the Government of Meghalaya. Startup India Yatra aims to scout grass-root level entrepreneurs in the smaller towns of India. The Yatra will provide a platform for budding entrepreneurs to realise their startup dream by getting incubated at excellent facilities and taking their idea to the next level. Commissioner and secretary in-charge of Commerce and Industries, M. R. Synrem, joint secretary, A. L. Mawlong, director of Commerce and Industries, J. L. Mawlong and other officials were also present on the occasion. It may be mentioned that entrepreneurship has gained startling traction in the recent years after the launch of the Start-up India Scheme and has seen a paradigm shift from being a uniquely metropolitan phenomenon to becoming an all-pervasive culture. It has been reported that there has been a massive boom in the number of innovative startups from Tier 2 and Tier 3 cities, and the non-metro entrepreneurs have shown unrelenting determination and tenacity in their pursuit of success. It is hoped that through the Startup India Yatra, entrepreneurs will also have the opportunity to get incubated to succeed in their journey from idea to enterprise. The Startup India Yatra has been launched with an aim to reach each and every district of the country.